The Taj Mahal is one of the “New” Seven Wonders of the World and perhaps the most recognizable building in the world. So, how would I, as a photographer, capture this image? Because it is completely symmetrical, the most compositionally-pleasing image is straight on from the arch, down the reflecting pools, to the Taj itself. But it’s been done to death. Weather and sun position could add drama to the shot, but it’s still the exact same shot that people have taken on their old Kodak Brownie cameras, cell phones and everything in between. I hate taking standard shots. Sometimes you have to because, well, it’s the Taj Mahal and I was actually there, and no image represents India more definitely, so I took the standard shot. But, I also looked for something different. I saw this family having a picnic on one of the benches on the grounds with the Taj in the background. Their two older children were playing “tag” and running around on the grass and jumping onto, over and off of benches. What struck me about this scene was just how ordinary it was to them. This family was behaving exactly as it would have at home or in a neighborhood park but they were at the Taj Mahal! So, that’s what I shot. 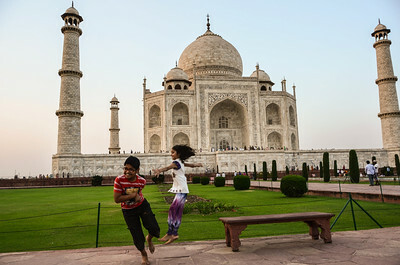 Two kids playing, oblivious to the fact that the most famous building in the world, that people travel thousands of miles to see, was right behind them. It’s not a great photograph and I’d like to think that I would shoot it from a more pleasing angle today, but I love the story that it tells.